This week our guest is Heidi Parkes. Heidi is an award winning artist, quilter and mender who specializes in hand work. Heidi is a graduate of the Art Institute of Chicago and now resides in Milwaukee Wisconsin. 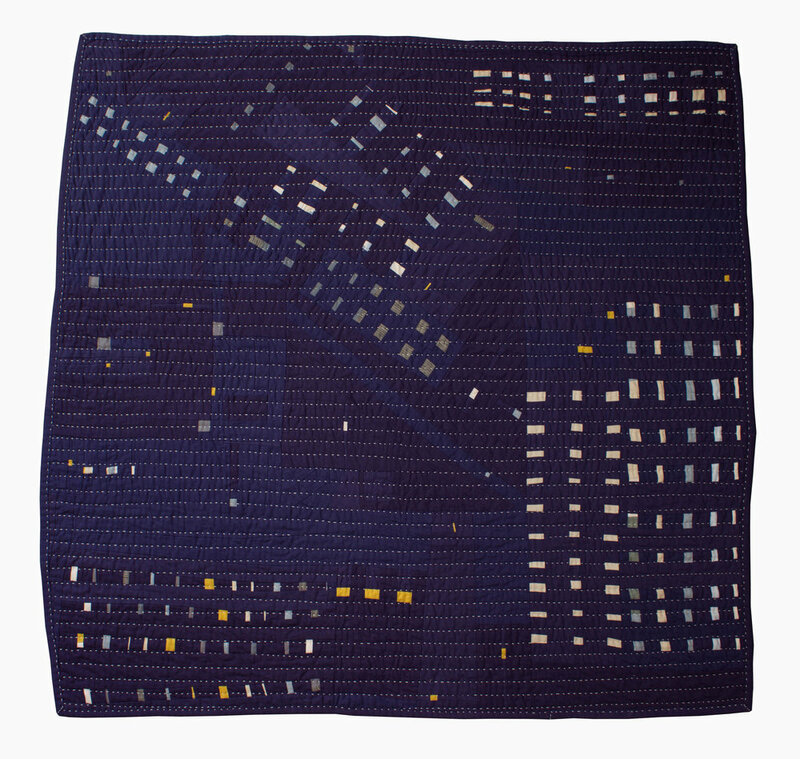 Her work has been exhibited nationally at QuiltCon, with The Piecework Collective and in numerous textile museums around the country. She works with textiles of our everyday lives often incorporating them with fabrics that she has enhanced by embroidering, staining, and or dyeing. She pieces these together, collaging and layering, evoking memories of her past, times and places, beautifully reminding us all of our own. To me, working improvisationally means that I'm showing up curious. It's art that evolves, and that I make to answer a question, to find out why, or to marinate on in hopes of digging deeper into a subject. I define improv art as an art that is responsive, evolving, and unexpected. Looking back, most of the art made in my childhood was not particularly improvisational. I had a plan, and I executed that plan to the best of my ability, without a sense of wonder. I was looking to match the picture in my head with my skills and materials. It was only later, in my independent study classes in high school that I began to flirt with improv, and allowing things to happen. My study of ceramics, and the aesthetic of wabi-sabi were first sparked at that time. Once in college, at The School of the Art Institute of Chicago (SAIC), I began making art about deeper ideas, and became curious about how I might visually represent something that wasn't 'visual.' The desire to make art about emotions and experience gave birth to an improvisational working style for me. I do work improvisationally, and that manifests in me showing up curious. It is also about the denial of the mistake. In performative improv like dance, theater, and music, they must continue, invent, and move forward without fretting over their moment to moment choices. I carry a slow version of this into my studio. There is a performative element when I'm quilting, and I allow things to happen in my work. I work with improvisation every day. I've been asked to contribute here for my improvisational quilting, but I use improv in many aspects of my life. I'm a yoga instructor, and all of my yoga classes are taught improvisationally. I often cook improvisationally. I was a high school art teacher for 9 years, and now I teach workshops on quilting, and when I teach, I show up curious about who my students are, and what they will make. I'm responsive to their questions, and the limitations of our materials, space, time, and experience: that's improvisational teaching. When quilting, I often begin with a plan, outline, questions, and a feeling, then I release these and think of myself as being 'in collaboration,' with my circumstances as I'm making. If something unexpected happens, I work with that instead of fighting it. I also mend clothing, and every day that I wear my clothes, I'm 'improvisationally,' creating areas of wear as I collaboratively bump up against the things in my world. I'm often inspired by books. Authors like Marcel Proust, Antoine to Saint-Exupery, and Milan Kundera have sparked big questions in me, which have contributed to the themes in my art. Working in a series is a helpful way of extending those themes, so that I never feel 'stuck,' or unsure of what to make. A powerful tool that I learned at SAIC was to pay attention to my scraps. This means noticing what I'm doing when I think it doesn't matter- when it's subconscious, or appears inconsequential. This could be the wear in my clothing, my paint pallet, my thread trimmings and the way I store them, the shape of my discarded fabric after cutting out the things I want, or the clothing and fabric in my goodwill donation bag. Looking at these items and habits is a powerful window into my process, and often helps me if I'm stuck, or need a place to start. I love finishing up, I'm a mono-tasker and usually only make one quilt at a time. I believe this is because I'm so curious about how the work will turn out. Working improvisationally is therefore a main motivator for me to finish things. The things I read. My life struggles. The shapes, textures, and actual objects around me. Anything I’m curious about. I use that inspiration as a reason to make my quilts. I make one quilt at a time because I’m curious to see how it will turn out before starting the next. What advice would you give to someone interested in trying to work improvisationally. Can you share some good advice that you received that helped you become more comfortable working this way? Many forms of improvisation happen live, like Jazz and improv theater. Many improvisations also happen in under an hour. I usually take 50 hours, unobserved, to make an improvisational quilt. This is very different from the ‘improv stereotype’ that I was initially familiar with. I would encourage others to explore the breadth of options available to them. I personally love the immediacy and commitment of cutting fabric, and piercing a needle through cloth. I love spending huge expanses of time in exploration. I also love visual art for its static nature: that time condenses, and that in a second a viewer can see the whole work of art at once— and as they linger over a work of visual art, more is revealed to them without the work of art having changed. What if I edited out the parts of quilt making that I find unpleasant, and made a quilt with only techniques that I enjoy? Currently, I'm reading about (and watching on youtube) metaphysical meanings for physical ailments, and healing as written by Teal Swan. I'm reading 'Emotions and Essential Oils,' and exploring essential oils for health and my own emotions. I'm slowly reading "Meditations on Intention and Being," by my yoga instructor Rolf Gates. I've been listening to the podcast Mythic Medicinals by Amber Magnolia Hill, and have been excited about her conversations on herbs, ancestry, and dream work. I've read and loved, and still think about, "Hold Still," by Sally Mann. "The Seven Laws of Spiritual Success," by Deepak Chopra. "The Little Prince," by Antoine de Saint-Exupery. "Remembrance of Things Past," by Marcel Proust. "The Unbearable Lightness of Being," by Milan Kundera. "The Highly Sensitive Person," by Elaine Aron. I'm watching the news a lot lately. I watch PBS Art 21. I'm very excited to watch Walking Dead season 8 now that it's out on Netflix- I'll be quilting or mending while watching it. I watch Matthew Hussey on youtube every weekend, and appreciate his life and dating advice. I recently watched 'All I See is You,' and really enjoyed that film. I frequently rewatch "Beginners," by Mike Mills, and love that film. I was just in New York where I saw some live Jazz, saw the Quilts of Gee's Bend at the MET, saw the Piecework Collective exhibition, and quilted and talked quilts with my friend Zak Foster. I'm looking forward to attending EXPO Chicago and SOFA Chicago at Navy Pier this fall. I always love looking at art from Mark Bradford, William Kentridge, Ghada Amer, Mark Rothko, Georgia O'Keeffe, and Cornelia Parker. Thank you Heidi for sharing your insights and improv process. I really love realizing the similarities and the differences we, as improvisors, all possess. I love your ‘What if. . .’ response as I have altered my methods of creating to enhance my enjoyment as well. It often takes me more time but I would rather spend more time doing the things I love. I also like and affirm to your idea of accepting our mistakes in our making. I feel quilters often have to adhere to very strict ‘rules’ of construction and craftsmanship that sometimes other arts do not. I say let’s embrace our mistakes and show our humanity by flaunting them and deeming them a part of the beauty of what we do. Do our best, to be our best, but accept the little slips along the way. Learn more about Heidi and her work and her workshops on her website, and follow her everyday process on Instagram.